From the June 2016 Desktop News | Each year students from the College of Arts and Sciences prove themselves nationally, and with two Truman scholars, two Hollings Scholarships, and four Fulbright Awards, this year is no exception. opportunity for students, scholars, and professionals. Pandora White, from Fayette, Mississippi, a doctoral student in chemistry, received a Fulbright research award to Poznan, Poland. Her work will investigate the mechanisms of action of trivalent chromium and bitter melon in enhancing insulin signaling in rats. Brandon Hooks, a graduate in international studies and economics; Perrin Lowrey, a graduate in psychology and German; and Abigail Thompson, a graduate in applied economics and political science, each received awards to teach and research abroad in Spain, Germany, and Russia respectively. The Harry S. Truman Scholarship Foundation selected 54 U.S. students to receive a Truman Scholarship this year. UA was among only six institutions with multiple Truman Scholars in 2016. Each new Truman Scholar receives up to $30,000 for graduate study. Scholars also receive priority admission and supplemental financial aid at premier graduate institutions, leadership training, career and graduate school counseling, and special internship opportunities within the federal government. Ciara Malaugh is a junior studying political science, French, and psychology from Huntsville and Ireland. She hopes to combine her love of languages with her campaign experience in social justice and her immigrant background to work in the field of migrant justice, particularly with refugee populations. Her adviser is Dr. Robert Halli, dean emeritus of the Honors College. 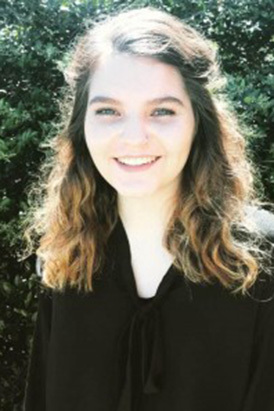 Dana Sweeney is a rising senior pursuing a Bachelor of Arts in English with minors in Mandarin Chinese and social innovation and leadership. Sweeney plans to work at the intersections of storytelling and policy development, with a particular interest in determining how popular narratives of poverty, class, and inequality are constructed and how they influence public assistance policy in the South. The Ernest F. Hollings Undergraduate Scholarship, given by the National Oceanic and Atmospheric Administration, provides $9,500 a year for full-time study during students’ junior and senior years and $7,000 for a 10-week internship at NOAA or an NOAA-approved facility during the summer between the junior and senior years. Blair Morrison is a marine science-biology major with minors in French, geology and the Blount Undergraduate Initiative. At UA, she studies the effects of ocean acidification on aggressive behavior expression in mangrove rivulus fish and will soon be executing an independent research project examining substrate effects on planktonic larval settlement. Her faculty mentor is Dr. Ryan Earley, associate professor of biological sciences. Kathryn Shay is an environmental science major, a member of the University’s Honor’s College, and an Emerging Scholar. Her research at the University involves developing automated methodologies for quantifying avian composition and abundance utilizing algorithms and custom SongScope recognizers she builds.